Only a short distance from downtown Juneau are the Mendenhall Ice Caves. The Mendenhall Glacier Recreation Area is possibly the most well-known natural feature of Juneau. The Mendenhall, one of thirty-eight glaciers emerging from Juneau Icefield's 1500 square miles, stretches thirteen miles towards sea level, ending at the Mendenhall Valley's north end. This area is a section of the Tongass National Forest. The Mendenhall Ice Caves fascinate both visitors and locals alike. 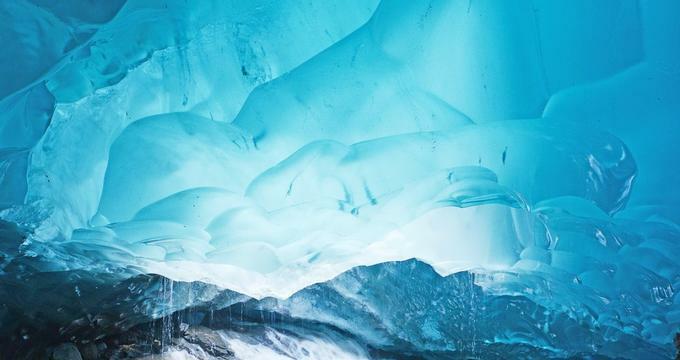 The striking blue color of the glacier is created by air being squeezed from ice and frozen snow, so that the glacier ends up absorbing every color except for blue. New caves are carved regularly throughout the glacier as a result of melting water running through and under it. The caves collapse over time from the general shifting and retreat of the Mendenhall Glacier. These forces are constant and make a trip to the Mendenhall Ice Caves both dangerous and thrilling. Visitors can expect unstable footing, falling rock, fast-moving streams, and dripping water during the summer. Due to the trek to the caves involving hiking on a largely unmarked trail, it can be easy for hikers who are unfamiliar with the area to become lost on their way back. It's recommended that visitors hire an experienced guide who know the area well, including the ice caves' current conditions, if they want to visit the glacier. Visitors should also be sure to allow plenty of time to explore the area. It can sometimes take up to eight hours round-trip depending on the conditions, and the way to the ice caves is mostly unmaintained and unmarked. The right equipment, plenty of water, and waterproof, sturdy footwear are also needed. Also, it's best to dress in layers and quick-drying clothes. Access to go inside the ice caves isn't guaranteed. They may be closed to visitors at any time due to conditions. There are other way to enter the Mendenhall Ice Caves, but they require knowledge of ice caving methods or a guided tour. One trail in the Mendenhall Glacier Recreation Area is the West Glacier Trail, starting in a forest. The trail is mostly level for a while, but gets pretty steep. The trail can also be slick and muddy at times in some area, and there are uplifted roots and rocks throughout the trail. The trail includes stairs, switchbacks, and bridges. There is also a large boulder, but a knotted rope is provided to help visitor climb up it. Along the way is a scenic overlook, with the trail ending at an area with exposed rock near the glacier and shrubbery. Other hikers have created cairns, or orderly rock piles, to help mark the trail. From the end of the trail, visitors can follow a primitive path, or carefully make their own path, to the glacier's summit. Once visitors have reached the Mendenhall Glacier, they can walk over the ice and loose rocks north, following along the edge until arriving at a ravine at which was the former entrance to the Mendenhall Ice Caves.